Planning a wedding can be hell for a bride, particularly when it comes to dressing the bridal party. Choosing the right colors and styles can be difficult, unless its spring. With all the colors and styles available, spring weddings are a brides dream; and as we all know weddings are all about the bride. Except, of course, when the adorable little ring bearer comes marching down the aisle. He is the one person, in my opinion, who can and should outshine the bride – at least for a few minutes. So it’s important that you dress him right, because as much as I hate to say it I have been at weddings where that cute little boy wasn’t dressed so cute. 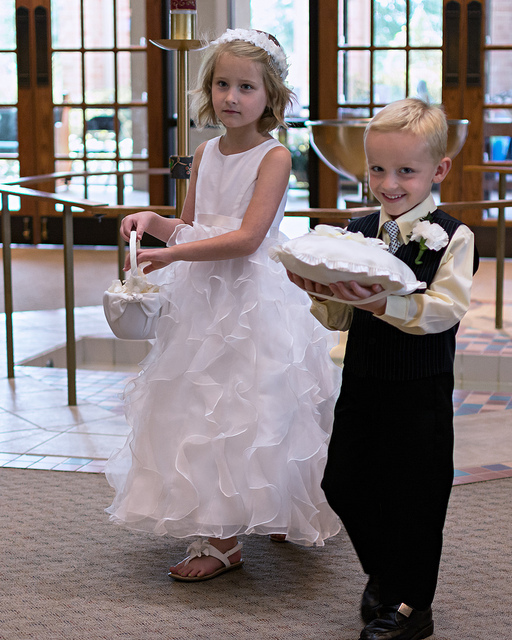 There’s a fine line between precious and what-were-they-thinking ring bearer outfits. Hopefully these tips I came up with will help you. One rule you should always remember is: gimmicky ring bearer outfits may look cute in a magazine, but they won’t look so cute 20 years from now in your wedding album. For example, if you’re ceremony is around Easter doesn’t mean you should have him wear every color of the pastel rainbow. Seriously I once saw a little boy wearing pastel blue, pink, yellow and turquoise. You want him to steal the spotlight, not people’s eyesight. Stick to neutral colors with maybe an accent color for the bow tie or cummerbund. Keep it simple so he wears the outfit, not the other way around. Another good tip is that although you might see unique (translation: odd) ring bearer outfits, a traditional boys tuxedo is usually the best choice. I know, I know, tuxedos are so boring and traditional – but they’re not. They’re traditional attire for a reason: a tuxedo ALWAYS looks good. Face it, there is nothing cuter than little boys tuxedos, everybody oohs and aaahs when they see him. So even though its spring and the weather is warm, save the knickers (shorts for those of you born after 1980) for Halloween and get him a tuxedo. You can spice it up with a stylish vest or graphic tie. There are also plenty of boys suits you can pick if boys tuxedos don’t work. Trust me, you’ll look back at your pictures without cringing. Many spring weddings take place in a garden or yard, so if you want to dress him in something less traditional/more casual you have plenty of choices. A stylish pair of Khakis, paired with a button down shirt and vest will have your ring bearer looking his absolute cutest. Pair it with a vest to up the cuteness factor to insanely adorable. You could also go with a pair of black jeans, button down shirt and suspenders and bow-tie for a nerdy/chic look that only a little boy could pull off (seriously no adult should ever wear suspenders). You can’t go wrong with either of these looks. The most important thing to remember is: your ring bearer is a child, not a circus performer. Make sure he is both stylish AND comfortable. If he’s fidgeting or tugging, maybe the material or cut of the outfit is wrong for him. If he has a problem walking in dress shoes, let him wear black sneakers. He’s a child, he’s still going to look cute it’s not going to ruin the wedding. After all, weddings are all about the bride (until the ring bearer comes walking down the aisle).